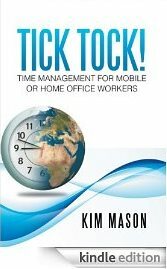 This is a little gem of a book about time management for home office workers, written by somebody who is speaking from practical experience. Kim Mason is an independent travel agent working under the TravelManagers banner, and she is one of 400+ travel agents in that organisation who work from home. I came across Kim because I’m speaking at the TravelManagers national conference next month, and Kim and I are collaborating on a workshop about time management and productivity for home office workers. This book is short but full of practical advice for anybody who works from a home office or is contemplating making the move there. I particularly like that it’s a nice blend of strategy and tactics, from the Big Picture questions (for example, why you decided to work from home) to practical daily suggestions (such as how to choose your “open for business” hours). This entry was posted on Thursday, July 17th, 2014 at 10:00 am and is filed under Uncategorized. You can follow any responses to this entry through the RSS 2.0 feed. You can leave a response, or trackback from your own site.